Bernie Sanders at a rally last weekend in San Diego. The crowd gathered in Waterfront Park chanted “Bernie! Bernie!” as “Disco Inferno” by The Trammps blasted in the background. Outside the gates surrounding the park was a long line of supporters, standing on their toes to try and catch a glimpse of him. Vendors sold Bernie apparel ranging from rainbow t-shirts to pins adorned with his face. A man wearing a giant paper mache Bernie head took pictures with overjoyed pedestrians. As the sunset light began to fall on the park, Bernie Sanders stepped out onto the platform to address the cheering crowd. 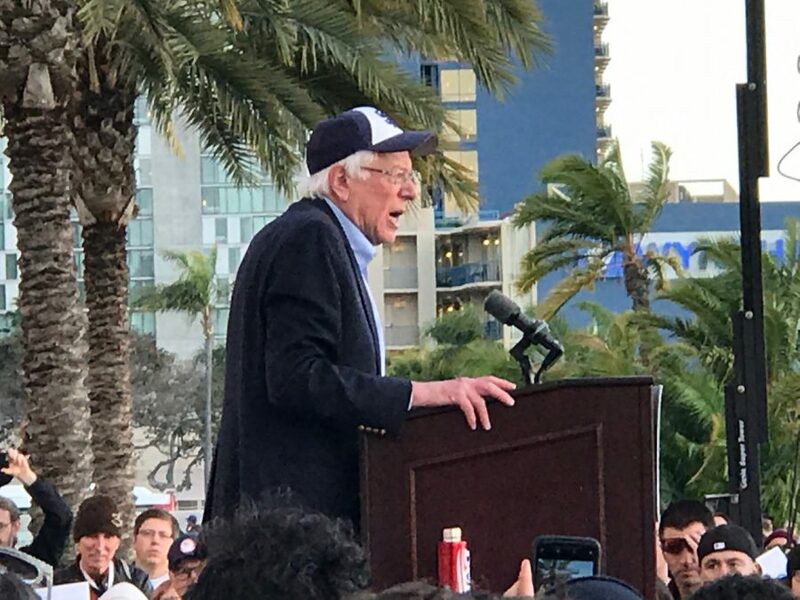 At Waterfront Park this past Friday, Bernie Sanders held a rally to discuss his policy and presidential plans with his supporters in San Diego. Sanders is a senator from Vermont and a Democratic candidate for President. He is a self-described democratic socialist. Major aspects of his policy are support of single payer healthcare, a higher minimum wage, and free public college. In interviews with young Bernie supporters, they said they like that he does not take money from big corporations. “I love that he’s not an establishment Democrat, and I love that for the first time we are seeing someone who is not taking money from big bank…because of that, he’s not going to be bound to anybody, shackled to any ideals behind closed doors. It’s the tide of change that we want to see,” said Ellie Coburn. Others said they supported him because of his social values. “I like [Bernie] as a candidate because he supports working class people and single payer healthcare, and he stands very explicitly against institutionalized racism. He is against structures like the prison industrial complex, and just covers a lot of topics that are important to me,” said Fae Harmon. “I support Bernie Sanders because he stands for my version of what I feel America should be. He stands for trans rights, gay rights immigrant rights, and everything like that,” said Logan Grayson. “[Bernie] is very consistent with his values. He doesn’t lie about what he believes in just for the sake of getting votes. I truly think that what he says is what he believes, because he’s been saying this stuff for 40 years,” said Peyton Dilday. “I feel that [his policy] is definitely justice for all, which is what America should be, so I back everything he says,” said Grayson.